DESOPADEC New Head Office Building, Warri - 2018. DESOPADEC New Head Office Building - Side View (Warri) - 2018. Building and Equipping of Aboh Sec. Schl. Aboh - 2018. Building and furnishing of Kokori Sec. Schl. Kokori - 2018. Commissioning of the Ugbenu Junction Market, Ugbenu - 2018. Donation of Boats to Ijaw Communities - 2018. Commissioning At The Navy Logistics Command, Oghara. Commissioning At Nigerian Prisons, Sapele. Board Members With The Delta State Governor. Commissioning At Nigerian Prison, Sapele. 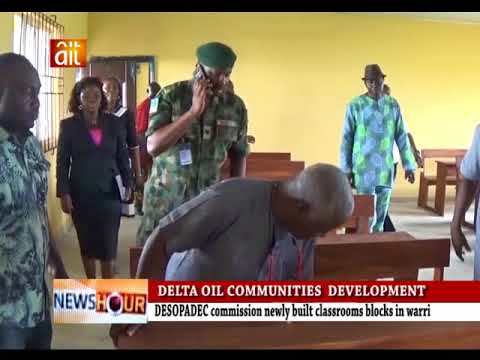 Nigeria Police Force Commends DESOPADEC Board, Governor Okowa For Funding Laudable Police Projects. 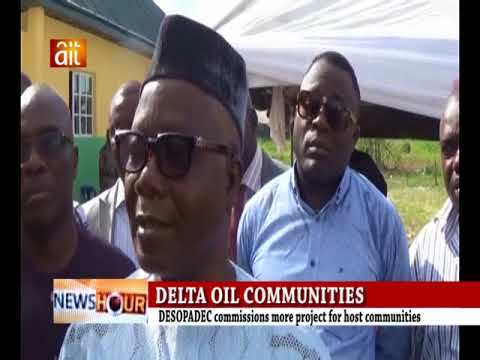 Desopadec Projects Within The Oil Producing Communities - 2018. Construction & Commissioning Of The Ultra Modern Palace For The Okobaro Of Ughievwen Kingdom, Ughelli South LGA. Construction Of The Ultra-Modern Full Boarding Ogulagha Modern Secondary Ogulagha, Burutu LGA. Construction Of Concrete Pedestrian Bridge With 800m Concrete Walk Way At Tsekelewu & Pinakiri Zion, Warri Noth LGA..
--(c)2018 Desopadec.com || All rights reserved under the Int'L Copy rights law.